Stabbed much? Gushing blood frozen in mid air in this stab wound! In this episode we wanted to create a simple stabb effect but with a little twist. Why use flat boring blood when you can use Ellimiorph to create a super cool 3D effect that gives the illusion of blood being frozen in mid air. If you’re gonna be stabbed, you might as well do it right. If you want to create your own knife or sword for your stab wound, you can always use aluminium foil and masking tape to construct it. Shape it as you like and then give the whole thing an awesome paint job and you are on your way. If you want to freak your Valentine’s date out, this might be just the makeup to wear. You can always claim your ex broke your heart. If you like this look you might like the Nailed it tutorial as well. It’s simple, easy and you will look epic! 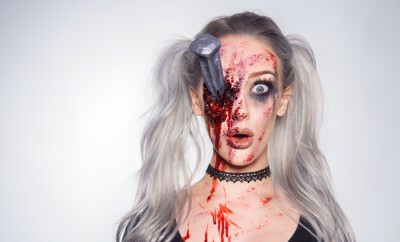 Take your SFX makeup to the next level. how does elli not have a boyfriend? Macs is adorable!! Loved seein him at beginning. He has such an amazing voice. He sounds like a radio host or talkshow tv host!! He should do either of those or both!!! You guys should have a show on tv!!! So talented. Would this work with an 'arrow'? My aunt trusts my beginner SFX skills and she wants to be a deer that got shot by an arrow. I tried lots of latex and cotton but couldn't get it to stay straight. Are you two married or relatives or friends or only business partners? PLEEAASSEE DO ONE FROM THE MOVIE "THE FLY" DO HIM AT LIKE THE END WHEN HES REAL FUCKED UP AND SCARY LOOKING!! Ooooo wow... JUST NOW NOTICING ELLIMACS is Elli and Macs' names put together.. Wow.... just wow. What is that small square you build stuff on made of? macs should bring out a album! March is coming how about doing a scary gory leprechaun look. +Aaqib Bath thanks 😃 And trying is the important thing, so even if it comes out messed up its still great! Hey Egg heads! =) It should have arrived by now so I'll check it up and get back to you tomorrow morning. Very cute tutorial! You guys are great. We'll see what the future holds hehe. I hope she realizes that your heart is more towards the left side of your body not the right..
<3 you Ellinore and Macs!!! You guys are so freakin clever!!!!!!!!!!! I love how you make these video's to show us that we too, can do this. I am so going to do this for Halloween. Thanks for sharing!! !